Wireless doorbells are a simple DIY alternative to running hard wires throughout your house, or even cutting ugly holes in the walls. This is the magic of wireless technology, its like a wire running through walls, but with no hole cutting required. Wireless doorbells are simply doorbell technology catching up with the age of the cell phone. Owning a wireless doorbell today offer many unique options, such as multiple door chimes, intercoms, cameras, and even smart phone compatibility. View this week's best deals on the best wireless doorbell! A wireless doorbell consists of two units. The Ring Wi-Fi Enabled Video Doorbell in Satin Nickel is a product that allows you to take charge of the security in your home. It is a small rectangular shaped doorbell with a silver and black Satin Nickel color. The material making the home device is Satin and nickel. With amazing features such as the built-in motion sensors, night vision with infrared and noise cancellation during communication, a great night sleep is likely since the security is top-notch. The wireless doorbell allows one to hear, see and speak to any person at the door using a variety of gadgets such as a tablet, smartphone or PC. Most importantly, it is wifi-compatible making the transmission of video, images and audio simple. Most noteworthy, the system is compatible with several operating systems such as iOS, Mac, Android and windows for up to ten devices. The Ring video doorbell allows the users to answer the door from any location. Furthermore, communication is easier since a two-way audio is in place. To further enhance it the noise cancellation feature promotes clarity. Instant alerts are provided when someone presses the doorbell or triggers the motion sensors. This allows one to be aware and alert when visitors arrive. There is a free Ring application that the user should install in the devices to facilitate communication. Upon the purchase of the product, a free trial to the cloud storage recording is available for 30 days. It allows the review, sharing, and saving of videos that the wireless doorbell captures when in operation. Another great benefit is that it is weather-resistant and this makes it durable. Also, it makes the locating and installation process stress-free since the user does not need much effort to protect it from the elements of weather. The infrared night vision feature ensures that the home is safe and protected whether during the day or night. The live view with streaming video and audio allows the monitoring of the home and surrounding areas covered. The video is in HD format and has a wide-angle of view. Like the other doorbells, it is easy and quick to install with a tool kit and guide available for reference. It comes with a rechargeable battery and thus any interruption of power does not affect the system. In addition, there is a lifetime purchase protection when one gets the wireless device. Finally, there are several color options to choose from. It allows the user to select a color that fits in with the color scheme and style of the home. From the reviews, users say the product provides an excellent value for money and functions efficiently. The ability to monitor the house using a smartphone, PC and tablet creates a great convenience since they can able to check the situation even when away from home. The installation process is smooth since the instruction booklet and video are available for reference in case of any difficulty. There might be a few software flaws if the installation is not done properly. Some users complained that they received faulty devices. However, the customer support team is quick to handle any issues that arise and offer replacements when necessary. The Honeywell RCWL3503A1000 is a wireless doorbell powered by a battery that works with chime and push buttons. It has a beautiful saddle brown color and it can work at a great operating range of 450 feet. The design of the doorbell is unique as it combines the use of natural wood and glass. It is suitable for users who love a bit of creativity as the positioning can be in a vertical or horizontal position. The product is user-friendly to install and setup, since it can be wall mounted or used as a portable device. The chime of the doorbell works with six transmitters that allow connection to one chime that can push buttons positioned at different entrances of the house allowing easy access. The user has an option to link the chime to door contacts or motion detectors depending on preference to create convenience. Extenders are available to extend the working range of the system which ensures all areas that need coverage are part of the package. There are six selectable chime tunes that provide a variety of tones minimizing monotony. Also, the CD quality sound is excellent. The surface-mount push button is stylish and is coded with a self-learning design that prevents any interference. The feature ensures safety and promotes a peace of mind. The battery power levels indicator keeps one informed in case battery power is low and replacement is necessary to avoid shutting down of the system. 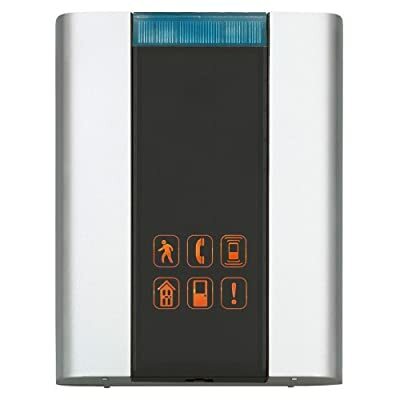 The six push buttons, motion detectors and door contacts enhance the security of the system. The volume of the chine is adjustable facilitating the right sound transmission. It is an affordable wireless doorbell. The main feature that seems to excite many of the users is the sound. It is very loud if needed and there is an allowance to adjust it depending on the preference. Another interesting thing many liked is the excellent coverage and range of the wireless doorbell. It helps that extending the system is possible in cases where the houses are large. The device fits in perfectly with most homes since it has a stylish wooden and glass design. Installation is easy and the horizontal and vertical mounting provides great options. Some users claim that what they received is not similar to how the product looked. However, the working of the doorbell is as described. 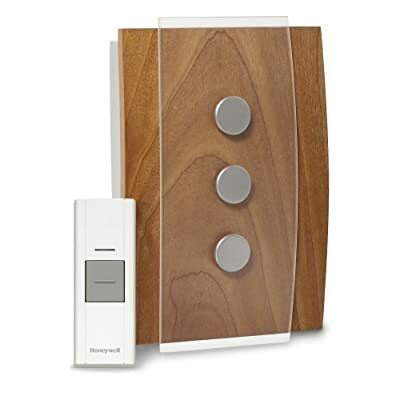 The Honeywell RCWL330A wireless door chime and push button is the epitome of a simple but elegant product that does everything you need it to do. Just a small white rectangle with a grey push button sealed with the Honeywell name at the bottom, this doorbell is all you need, regardless of what shape or style your house is. Because of its simplistic design, this doorbell will work well with any house out there without causing visitors to scratch their heads in confusion upon reaching your step. 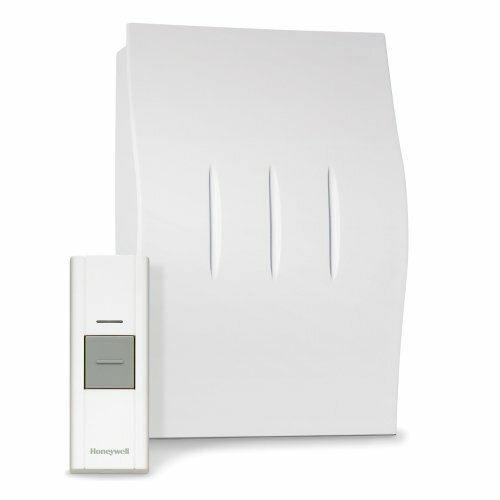 With all of the benefits that Honeywell offers, this Honeywell Décor wireless door chime is a necessity. Wireless doorbells themselves are notoriously easy to use and install, and this Honeywell Décor is no exception. It’s wireless and operated with batteries, making installation as simple as screwing it onto the wall. The wireless receiver that sits inside your house is equipped to handle up to six push buttons, allowing you to strategically place them at each entry point of your house. You can also use it with motion detectors or door contacts for a slew of security preferences you may not have considered before, practically turning your doorbell into a security system. You can choose from six tunes included with the Honeywell Décor wireless door chime to make the arrival of guests all that more fun, adjusting the volume to a level that’s able to be easily heard throughout the house yet not enough to cause a migraine. The coding system included in this doorbell is especially useful because it automatically adjusts to eliminate interference from other wireless products nearby. That way you’re sure to be free of static from other doorbells, walkie talkies or similar items. However, it has a 450 foot operating range, meaning your receiver can be placed just about anywhere and will easily and effectively pick up any chimes it needs to. The reviews for the Honeywell Décor wireless door chime suggest that this product is everything that it’s advertised as. The chime box can be easily hidden for those who don’t enjoy a panel on their walls, and customers have noted that it works through brick, metal and wood doors just as easily as if there were nothing between it. The batteries seem easy enough to replace, just as both the receiver and the push button are easy to adhere to the wall. The tones themselves are easy to change (although many suggested changing the tone before adhering it to the wall). While some complained that until this point it had been difficult to find a wireless doorbell that is able to pick up rings between heavier walls like metal or brick, most seemed to find their solution with the Honeywell Décor wireless door chime. As an affordable option, Honeywell Décor wireless door chime seems to be worth the time you spend installing it and the money you spend. This is probably the way to go if you are having difficulties getting through tough materials like metal or brick and is definitely the way to go if you’re looking for a stylish accent on your front step. If you’re searching for a wireless doorbell that has all of the options you’ve been longing for, the Honeywell Premium Portable Wireless Door Chime and Push Button is the doorbell for you. The door chime itself is small, sleek and incredibly discrete, perfect for someone who doesn’t care whether the neighbors know they got a new doorbell or not. The Honeywell Premium Portable Wireless Door Chime is wonderful because of all the add-ons and extras you can use with this device, and it’s made to be easy to install and program for even those with very little technological expertise. Like some of the other wireless doorbells on the market, this one too is set up for customization. It offers six tunes to choose from when it comes to deciding on your doorbell chime. It has all of the classics like Westminster chimes and the standard ding-dong, but also warm brass and fantasy chimes for those who like things a little bit more interesting. It also allows you to adjust the sound to whatever level you please, which is especially helpful for times when you want the doorbell muted. For those with children who are light sleepers, this is the perfect solution to your naptime problems. The receiver also has a flashing light notification, which can be activated when the bell has been turned to silent so that you’re still able to determine if you have company without the extra noise. This is also beneficial for those hard of hearing or deaf. The receiver is easily portable and allows you to easily carry it with you from room to room or out back and in the garage if necessary. The safety features included are also of great use, allowing you to set up specific chimes for when targeted doors and windows are opened. Motion detectors can also be added at an additional cost. Customers seem to be overwhelmingly satisfied with the Honeywell Premium Portable Wireless Chime, though many cite the instructions has relatively hard to follow if you don’t have a basic understanding of electronics. The door chime seems to be loud enough to hear throughout even large houses, including those with multiple floors. Many people loved the silence feature of the alarm which allows you to visually see from a readout when someone is at your door instead of hearing the chime. It seems to be a great feature for those with young children. The signal is also a benefit, given it can get through even brick and metal walls with few problems. Because it can also be set up in other areas besides the front door, many seem to use this product for entrances like gates or side doors. The Honeywell Premium Portable Wireless door chime is wonderful for those who enjoy outdoor parties or would like customization when it comes to doorbell options. By silencing the chime at any time, it makes it convenient for new parents to manage their household without having to worry about security issues. Jacob Jensen has put together a sleek and simple design for their long range wireless doorbell, offering an attractive product with all of the usability of other wireless doorbells. 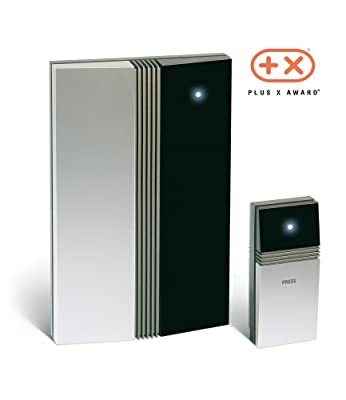 The receiver and bell push of this Jacob Jensen wireless doorbell are stunningly designed, split down the center into a silver and black finish and topped off with an illuminating light for a practical but stylish doorbell that will fit the needs of any house it adorns. The customers as well as the suppliers agree that this Jacob Jensen wireless doorbell is suitable for size and style of house. This wireless doorbell is well worth the money you pay for it. It includes a set of polyphonic tunes that can be programmed to the wireless doorbell to be used instead of the traditional doorbell sound. These are especially beneficial for the hard of hearing who may have troubles determining if their doorbells are actually ringing or not. Sounds include a classic bell, wooden door, a contemporary lounge tune, an Asian tune or a low-frequency tune for those that are especially hard of hearing. If you plan on pairing the one receiver with multiple bells for multiple entries, the different tunes can be used to determine which bell is ringing. This wireless doorbell also comes with everything you need to install it, including screws and double-sided tape. It even comes with batteries that are suggested to last up to two years. But when the batteries start to fade, the illuminating light doesn’t just serve as a light to find your way in the dark; it also allows you to tell the battery life left on your receiver. The volume can be adjusted to your needs and these doorbells are especially useful because a special configuration guarantees that there is no interference with other wireless products nearby. The customers haven’t hidden their satisfaction for this product on their reviews. The reviews are overwhelmingly positive, many citing how easy it is to hear the doorbell from anywhere. Because the doorbell has an extremely long range, it can be heard anywhere in the house easily, especially with its adjustable volume. The five sounds (and more sounds that can be purchased in addition to) make it easy to distinguish between entry points and for some make it easier to hear. Other customers suggest that it’s the style of the doorbell that has kept them satisfied. Unlike old-timey doorbells made of plastic and wood, this design makes for an attractive impression upon first entrance of a home. Wireless doorbells themselves are useful because they allow homeowners to replace their existing wired doorbells with little complication. There’s no need to be an electrician to install and they require hardly any maintenance save from the few occasions you may need to replace the batteries. The Jacob Jensen wireless doorbell design is a product that has been used in a number of people’s homes with no complaint. Its sleek design and durability will provide the doorbell solution that’s most needed in your home. A head unit of traditional door bell is often connected straight to the electrical system of the house. Each time a visitor presses a button on the door, an electrical circuit is finished plus a ring box or bell rings at home. Recently, however, an alternative choice to cable ring system may be developed that addresses most of the problems inherent in a very system of the type. A radio doorbell eliminates the requirement of internal wiring might be installed for at least tools, and the chime receiver box can be placed anywhere within range of the transmitter ring. A wireless doorbell system usually is made of two components: a transmitter and also a receiver box bell carillon. Whenever a visitor presses the button wireless doorbell at the front end door, it-powered transmitter sends a sign by way of a designated frequency radio. The receiver inside the chime box detects this signal and emits a loud electronic tone on the owner’s choice. If multiple receivers within choice of the transmitter, all of them when it will sound simultaneously. Installing an invisible doorbell product is a comparatively simple work for a homeowner or tenant. The transmitter may be associated with ring the threshold with double-sided tape or by installing screws supplied with the system. Do not need remove an existing wired doorbell system or attach any cables towards the transmitter. Most wireless doorbell transmitter battery feed, meaning the master may need to replace the batteries periodically. Your second component of a system is really a wireless doorbell chime receiver unit box. A holder can put this box chime anywhere within choice of the transmitter from the bell, that may differ from one model completely to another. Some boxes are wireless doorbell batteries, but others could possibly have an influence cord that connects to any household outlet. Some bell boxes emit only ring tones or standard hood, while some could be customized to try out many different songs or other distinctive sounds. Many can also be mute if privacy is desired. A radio doorbell is great for those who rent apartments or are reluctant to install new wiring in the house solution. System installation requires no special training or electrical equipment. Tenants may take away the entire system without causing any harm to the house of a landowner. There can be numerous prices in relation to wireless doorbell systems. A rudimentary model usually has a restricted range and few options chimes, while an invisible doorbell high-end features chimes customizable frequencies of self-limiting inside scope on the extended transmitter and also decorative elements for the ringer the threshold and also the bell box. Some wireless doorbell systems have an invisible intercom for fast communication. Luxury wireless doorbell systems can also be developed to allow remote access coming from a cellular telephone specially equipped, allowing staff to get in the home without unlocking the doorway or leaving a security system. Everything and everyone in today’s society is going wireless, and there is no going back. Once we have a good thing, we usually never want to give it up! No exceptions with wireless doorbells. Wireless doorbells solve the problem of having to run wires through walls and having to worry about permanent chime placement. With a wireless chime unit, you can place it anywhere in your house, within range at least! Want to understand the technology behind wireless doorbells? Well you have come to the right places. Before we dive deeper, lets all begin on the same page and start with some basic assumptions. The button is placed outside of the door in a convenient location where you visitor will be obliged to press it. As mentioned, the doorbell button contains the radio transmitter, and transmits the signal do the wireless chime unit. This button is usually powered by a battery that is meant to last a long time. All this unit has to do is activate a frequency, which takes very little energy. In reality, the signal is send with equal power in all directions. It is up to the receiver to be within range in order to receive the signal given out by the transmitter unit. This signal is only transmitted when the button is pressed. If you have a wireless chime unit with multiple sound options, then it is up to you to select the sound, not the button transmitter. If you have ever used RC cars or planes, then you are already familiar how these types of devices function. Worried about your neighbors also having a wireless doorbell, and worry about their transmitter setting off your chime? Don’t be! Many modern day doorbells allow you to choose your own unique frequency to avoid this problem…otherwise it may be a fun way to prank your neighbors! The chime you hear is the receiver. 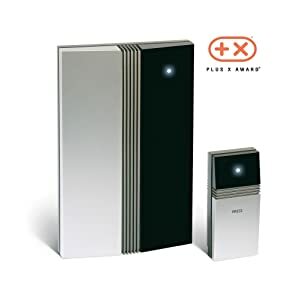 That means, the small unit that sits at your front door has a tiny transmitter – easily strong enough to reach anywhere on your house or property you might need to place the chime. One thing to keep in mind when choosing your wireless doorbell is if you want a battery or a mains model. Whilst the doorbells use very little power, the battery models will need the batteries replaced once and a while (as a rough guide, consider how often you might replace a battery powered smoke detector). Others typically have their chimes placed low, near or on a power socket, where they can draw their power from. Please be careful if removing any old, powered doorbells. Switch off the power where it enters the house, and check to see it indeed is switched off. Although it is usually low voltage, this is not always the case. Tape up the ends of any cut wires, keeping the two ends separated as you do (loose wires can cause internal fires if they come into contact). For a long time, doorbells have required a wiring system. Wire had to be fed through the wall, and the doorbell system was permanently position wherever it was installed – unless, of course, the homeowner was willing to feed more wire through walls. That’s not the case anymore. New wireless doorbell systems solve many of the old problems associated with wired doorbells. There are many benefits of wireless doorbells, but the three main perks to a wireless system are practicality, pricing, and improved range. So this makes choosing the best wireless doorbell a difficult challenge, as they are present the same great benefits. Wireless doorbells are far more practical than wired doorbells, simply because they can be installed or moved anywhere around the home and still work. No holes need to be drilled, no wires fed; simply install the button on your front door and place the doorbell anywhere within range. Pricing is no longer an issue with wireless doorbells, either; they usually cost no more than traditional wired systems. Finally, there’s the range. When first introduced, wireless doorbells had a short functioning range but with advances in wireless technology, these doorbells will now work just about anywhere in the house. Now that wireless doorbells no longer carry a hefty price tag, and their range can cover your entire home, choosing a doorbell has gotten a lot simpler. The only real question left is whether the doorbell might be moved in the future, or if it will stay in one place as long as you own your home. If you might have to move your doorbell, for any reason, a wireless doorbell system is probably your best bet. The benefits of wireless doorbells make them a great choice for the money! In the above table I mention a few wireless doorbells, and there is a reason why I put those particular doorbells front and center, because I believe they are some of the best wireless doorbells. Range – The range will be the distance between your doorbell button and the doorbell receiver/chime unit. Most people will place it directly on the other side of the wall that the button is on, just as with a wired doorbell. However, in order to take advantage of the new freedom you are allotted, you can now place the receiver unit anywhere you like (range limiting). When shopping, first determine the maximum distance you will want to place the receiver unit, and then reference the manufacturers range specs in order to verify that it complies with your range requirement. Chime options – If you’re one of those who will be going from a wired to a wireless doorbell, you will definitely be spoiled by the number of chime options you have. Wireless doorbells usually offer a number of chime options; ranging from a few, to over 40. More advance doorbells will allow you to upload a custom door chime, much as how you would customize your phone’s ringtone. Camera system: Why stop at intercom? What if you could actually see who is at the door. If the visitor does not use the intercom, this would be your only way of knowing who is at the door before opening it. Of course you could awkwardly peak through the peep hole and awkwardly show the top of your head from your door window. This, like the intercom system, is more of a luxury feature to make you feel safer. Its your home, and you should feel safe. Intercom system: Want to be able to hear whoever is at the door? Your visitor can speak into the intercom before your open the door, putting you more at ease. These systems are a little more pricey, but the comfort of knowing who’s at the door is always worth it. Does it make your eyes happy? : Again, this one goes without saying. Get a wireless doorbell that you won’t mind looking at. The biggest tech giants, like Honeywell, GE, and Jensen are all jumping on the wireless doorbell bandwagon, and for good reason! As these tech giants compete, they must all put out a quality product to stay competitive…therefore you can trust that today’s wireless doorbells are reliable and long lasting. With all of this quality competition, how do you choose the best wireless doorbell that is right for you? It all comes down to the options that these wireless doorbells offer. Some offer more types of chimes, while others may offer a longer range. It also depends on personal taste, such as styling. With most wireless doorbells on par with each other, styling is a huge factor in deciding. If I had to give a short answer I would say: “Choose whichever one looks best to you!”. We live in a time where everything is changing from wired to wireless. Be it web, phones and numerous various other necessary things, its all going wireless, and for good reason! In this write-up, we review a few of those handy reasons why a wireless doorbell would be beneficial to you! Doorbells are not to be left out in the wireless craze! And it is not simply a fad, they serve a very practical purpose. Wireless models of doorbells in fact appeared in the market many years ago, yet are just gaining traction as being practical home accessories. While there are benefits to both wired and wireless doorbells, here we will about why wireless doorbells are awesome! Nevertheless, there are lots of benefits of wireless doorbells over wired ones. 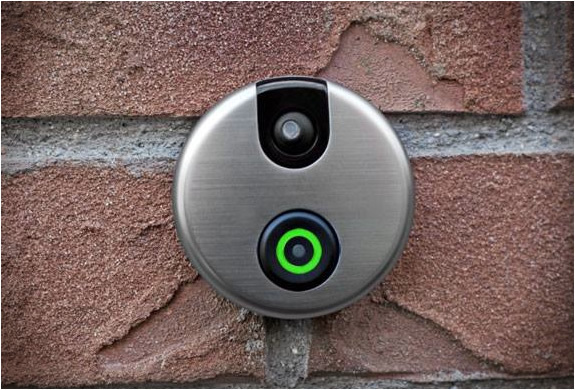 This is the single factor has actually made wireless doorbells widely popular. Since wireless doorbells are free from problems of electrical wiring demands, they are extremely easy to set up at home. Though most people do not place the button and receiver unit very far apart, the lack of wiring through the wall is a great enough benefit. They create much less damage to your house walls given that you do not need to drill gaps along the wall to accommodate cables. Merely plug-in the chime and fix the push button at the door. Now just wait for a visitor to ring your doorbell. Because wireless doorbells are free from cords, they are easily portable too. Which means that you can hold them around easily if you would like to alter their position in your home or bring also to the brand-new residence without any sort of issues. No complex un-install and re-install treatments here. Picture, you want to do an experiment of altering your chime position from venue to kitchen side. 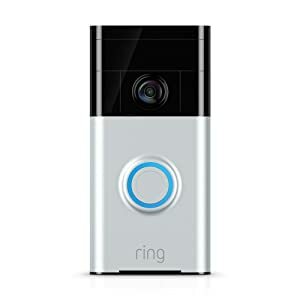 When it come to wired doorbell, you certainly have plenty of common labor in regards to eliminating the chime and re-installing it at the brand-new position. Obtain wireless doorbells. Your experiments will certainly be enjoyable, not discomfort:-). Wireless door chimes are quite versatile when it involves connecting several push bells. There are useful scenarios when people require several push buttons mounted at various doors at their houses and your door chime have to reply to all of these. Wired doorbells will certainly be left with restriction of their doorbell holding tight to it’s current location and extending a wire to sustain new push button would certainly be not less than a pain. Wireless doorbells are a wind when it pertains to sustaining numerous press bells. There are rather a lot doorbells available at Amazon.com which sustain numerous buzzers. Several enhanced wireless doorbells deal with door get in touches with and various other house safety add-ons making them integral part of your general home security system. For example, this doorbell collaborates with movement sensing unit and door calls for included safety and benefit. This is a quite noticeable side-benefit. Considering that cables are missing from the doorbells, the wireless doorbell packages are usually more affordable compared to wired ones. Quite interestingly, you could obtain top quality wireless doorbells from leading brands also under $30. And for about $50 you obtain a sophisticated wireless doorbell such as this one from Honeywell. Have you changed your option from wired doorbell to wireless? With such a large range of gadgets on wireless doorbells around, picking a wireless doorbell ought to be a really easy activity for you. In case you require guidance in selecting a wireless door chime, do read our wireless doorbell acquiring overview.